We’d love your help. Let us know what’s wrong with this preview of Pretty Please by Diane Hoh. On the campus of Salem University, Johanna Dunn's beautiful face is scarred in an accident and a crazed perfectionist decides that Johanna is now too ugly--to live. To ask other readers questions about Pretty Please, please sign up. I really enjoyed this book. Simple plot and characters but a fab book. Big fan of this series, first read this one at 14 when it was out and many times since. I'm almost 33 now, sigh, and I don't remember this one being so get-under-your-skin annoying. It's just that though. Jo rants about how people shouldn't focus on looks and how unimportant they are and how she hates being singled out for being a Beautiful People...at the start. After she uses her face to open a glass door, let us just say her tune starts a changin'. Jo's pretty lucky, she's only got a few nast Big fan of this series, first read this one at 14 when it was out and many times since. I'm almost 33 now, sigh, and I don't remember this one being so get-under-your-skin annoying. It's just that though. Jo rants about how people shouldn't focus on looks and how unimportant they are and how she hates being singled out for being a Beautiful People...at the start. After she uses her face to open a glass door, let us just say her tune starts a changin'. Jo's pretty lucky, she's only got a few nasty cuts and some bruises that will fade, but with the way she and her friends carry on you would think she looks like Freddie or Jason. She now can't stop talking about how good everybody looks and how messed up she is and how her cuts itch and are ugly and blah blah blahhhhhhh! Jo should be on her knees thanking the stars or something. The nutbag in this book, is just super nauseating and confused. They say they are getting "rid" of the ugly people to save them from humiliation because they care so much, but wait, now they are getting rid of the ugly people because they have no right to show their ugly faces to people, but wait again, now they are getting rid of the fuglies because when they were fugly as a kid their parents made them stay inside until dark every single day for 12 years and the fuglies that they encounter should have to suffer the same fate. So which one is it? If it's to protect them from being laughed at, well then it can't be to protect society from their ugly looks. 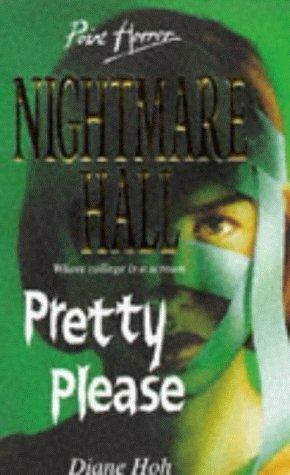 I am starting to read ALL of the Nightmare Hall books and so far this is the best book that I've read. In this book a girl named Johanna is apart of a group called "The Beautiful People" one night when "The Beautiful People" go to a party a tragedy happens and Johanna falls through a glass door and scars her face up. When she goes to school everyone stares at her because of her scars, but one person thinks that Johanna is a litle too ugly to live. First someone starts doing weird things to her: som I am starting to read ALL of the Nightmare Hall books and so far this is the best book that I've read. First someone starts doing weird things to her: someone covers all of her mirrors with a black velet cloth, someone sends her a hat that has a black face veil on it that covers her face,then someone sends her a make up kit to apply to her face to cover her scars. Then one day Johanna is walking through the woods and all of a sudden someone starts running behind her, attacks her with a trash bag and covers her face up and tells her " You should have listened to my warnings when I told you to cover your ugly face up!" First of all, the cover terrified me as a kid. When I wasn't quite old enough to read them, I still enjoyed going to the Teen Horror section and flipping the cover to see the surprise image behind the window. Some were cheesy, but others were downright frightening. This was downright frightening. The story itself is pretty disturbing, but more in a sad way than a bone-chilling terrifying way. The characters don't especially pop out as memorable or well-developed: even Johanna didn't seem to have First of all, the cover terrified me as a kid. When I wasn't quite old enough to read them, I still enjoyed going to the Teen Horror section and flipping the cover to see the surprise image behind the window. Some were cheesy, but others were downright frightening. This was downright frightening. The story itself is pretty disturbing, but more in a sad way than a bone-chilling terrifying way. The characters don't especially pop out as memorable or well-developed: even Johanna didn't seem to have much personality, but at least she was level-headed and not as vain as the plot would suggest she is. Though she knows she is a beauty, she doesn't flaunt it, and her concerns about her face after the accident stay at a normal level. She worries, like a young woman naturally would, but she's ready to move on with her life. Only when she encounters a few strange attacks does she start to get concerned that one of her friends might not accept her with scars on her face. This story was a bit weird, but I liked it better than the other books in this series that I read. The storyline might be a bit cheesy to some - she got her face cut up and for some reason someone wants her to cover it up - but the person responsible for the mysterious attacks reveals herself and tells her story. Overall it was an okay book, it just requires a bit of suspension of belief to enjoy. The Nightmare Hall series was a favorite of mine as a kid. I never read anything else like it, mostly sticking with the babysitters club and girl talk. I loved that it was scary without being gory, and it was nearly impossible to guess the bad guy. This one was one of my favorites, and I was thrilled to see it in e-book format. The only thing missing from this story was seeing a couple of the other character's reactions to whodunit. As I read this, I was frequently reminded of my Christopher Pike days as a middle schooler. Suspense and mystery with a bizarre plot but written for an audience not yet ready for the evils actually existing in the real world. I used to save up my babysitting money for each new release. At the end was an author info section and I realized that this was just like my favored Mr. Pike - this was an '80s and '90s tween suspense. Just not as good as the others. I had a few issues with this book as I first read this series when it came out in the 90s and now it's even cheesier than I remember it being back then. it was entertaining and I had no idea who the "killer" was but it was very simply written and so 3 stars. Diane Hoh is the author of fifty-seven novels for young adults. She grew up in Warren, Pennsylvania but currently resides in Austin, Texas. Reading and writing are her favorite things, also gardening and grandchildren.